The State House is the official residence and principal workplace of the President of Sierra Leone. 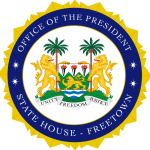 The State House is located at State Avenue, Tower Hill, in central Freetown, Sierra Leone. The Statehouse is often locally referred to as the seat of power.